UNITED NATIONS, June 4 -- Bill Gates the father, not the son, was at the UN on Thursday to pick up an award from the UN Population Fund. At the reception afterward, the talk was of who will take over UNFPA, when longtime Saudi chief Thoraya Obaid leaves later this year. There is also the UNfilled Gender Entity post. A prominent South Asian diplomat told Inner City Press that the US is calling around, trying to find out who has applied for the post. The history of the UNFPA Award is not pretty, a long time UNFPA staffer says. It was first funded in 1983 by India and China, whose Indira Gandhi and Qian Xinzhong in turn got the award. Worse, UNFPA for years tried to obtain the Nobel Peace Prize. The agency hired Norwegian for the source purpose of trying to reach to selection committee in Oslo. But it never happened. So they started their own award. The costs of the award, travel and reception are supposed to be funded by interest from the initial endowment. But they cost more, such that part of the costs of Thursday's foie gras and white wine, the source said, came out of UNFPA's regular budget. "It's a scam," the long time UNFPA staffer told Inner City Press. The US had at least two representatives at the reception. Earlier on Thursday, a US motion to get a gay and lesbian group consultative status at the UN was defeated by Egypt, Pakistan and China. "We have to work harder in the wider ECOSOC," a forthright American diplomat told Inner City Press. Another US diplomat however, who had actually been present during the vote against the group, said "no comment... you have to talk to Mark" Kornblau. But he has told the Press he will not answer any questions. And compared to his UK, French and even Russian counterparts, he is rarely at the Security Council stakeout or elsewhere in the UN. Is this how the US publicizes what it thinks is important? Watch this site. UNITED NATIONS, June 3 -- The UN rebuffed a gay rights group on Thursday, in a little covered bureaucratic meeting of its NGO Committee. The International Gay and Lesbian Human Rights Commission had applied for consultative status. Egypt, Qatar and others peppered the group with questions, including on whether its advocacy for gay rights might impinge on freedom of religion and of "discussion." Finally, the US called for a vote. 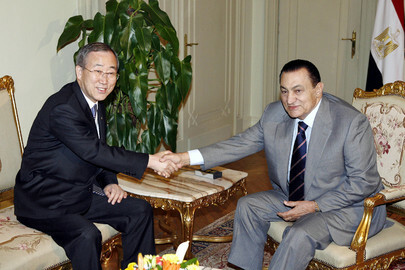 Egypt objected, saying that its questions to the group had not been "answered in a straight way." Some in the quarter-filled meeting room laughed. But Egypt persisted, prevailing in placing its motion, to put the application on ice, ahead of the US's motion for an up or down vote on giving consultative status. Standing openly with the US were Romania and the UK, which to its credit called the Inner City Press to the impending showdown. Ultimately on the vote, only three more countries took the US / UK position: Colombia, Peru and Israel. Voting to block the gay rights group's access were Egypt, Qatar, Security Council Permanent members Russia and China, Angola, Burundi, Sudan and Pakistan. Turkey, ever the self conscious bridge, abstained. Qatar listed some if its questions, about whether the group sought "special rights for LGBT." The UK said that allowing this block, based on repetitive questions, set a bad precedent. Even if the group answered every single questions, the UK said, the detractors would never be satisfied. And for now, at least in the NGO committee, the detractors are in the majority. Footnote: Inner City Press asked the spokesman for General Assembly president Ali Treki for a statement. Upon taking office, Treki called homosexuality an abomination. Now his spokesman's draft response talks about tolerance, but has a paragraph crossed out. But at today's UN the votes are what they are. UNITED NATIONS, May 11 -- The UN's statement on May 10 that on naming a panel of experts on war crimes in Sri Lanka Secretary General Ban Ki-moon's wheels are turning -- or spinning -- was amplified to Inner City Press on Tuesday by a senior Ban official. "Now they've come out with theirs," the UN official said, referring to the Rajapaksa administration's announcement of a "mechanism." "It will be a sham," the UN official continues. Inner City Press asked, but how long will it take the UN to reach that conclusion? The UN official shrugged. "They have to appoint the members." He paused. "Susan Rice did a very good thing," he said, referring to US Ambassador Rice's May 10 statement on Sri Lanka. "She welcomed it but listed expectations which they will never meet," the UN official said. Inner City Press asked the official, as it has now asked the US State Department, what ever came of the committee the Rajapaksa administration named in November 2009. The official shrugged. "There is an EU statement coming," he said. Earlier on May 11, as US Ambassador Susan Rice entered the Security Council for a meeting on terrorism sanctions, Inner City Press began to ask for a question about the statement issued in her name the previous day - what does it mean for the U.S.' support of Ban Ki-moon intention announced on March 5 to name a panel of experts to advice him on accountability in Sri Lanka? 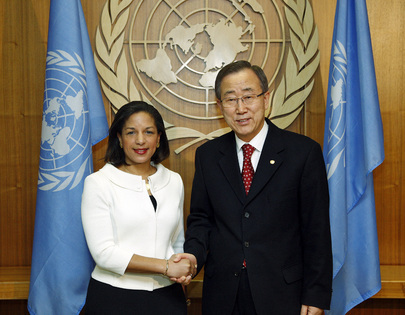 Ambassador Rice indicated she was busy. Later a genial Mission staffer came to asked what the question was -- Inner City Press rephrased it -- and said he would go in and get an answer. 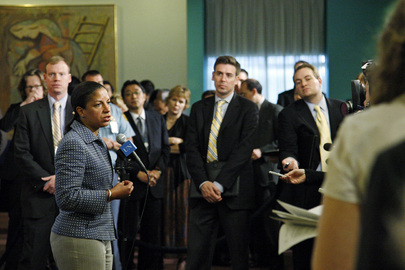 But leaving the Council along with Ambassador Rice, he said he'd have to check with the "Sri Lanka people." Hours later in the UN's North Lawn building he again promised an answer. But still as of close of business and deadline, none was provided. Inner City Press sent this and other questions to an Assistant Secretary of State in Washington. Watch this site. Inner City Press: There is a report in Sri Lanka that the visit of Lynn Pascoe has been delayed by the Government; that the request was made that it be in mid-May. The Government said no. Now dates in June have been proposed, and this article.. seems to link Pascoe’s visit with the appointment of this Panel of Experts to advise the Secretary-General on accountability -- meaning they wouldn’t be named until his visit. And now the visit, according to this, has been put off to June. Does the UN disagree with this portrayal? What is the connection between his visit and the naming of the panel? And is the visit not, in fact, going to take place in May despite the wheels that you described being motion? Inner City Press: Does the Government have the brakes on your wheels? Spokesperson Nesirky: Well, that’s for you to ask the Government of Sri Lanka. What I can tell you is that the UN wheels are definitely turning, and they’re well-oiled. And what they’re turning towards is, one, a visit by Mr. Pascoe, and, two, for the Panel of Experts that we’ve discussed many times here. Inner City Press: This article says that there are some connections between the two; that that the panel would not be named before the visit is made. I have been told by the Permanent Representative of Sri Lanka that, given changes on the ground there, no panel is needed and he predicts that no panel will be named. So, is there any connection at all between Mr. Pascoe’s visit and the naming of the panel that’s now been delayed more than two months? Or not been delayed; it’s been two months since it was announced it would happen. Spokesperson Nesirky: Well, I don’t think that we should draw a line between the two or to see this as cause and effect. The visit and the composition and naming of the panel -- these are two separate matters. Footnote: another reason clarification of Ambassador Rice's statement, is sought is the re-emergence in State Department of Samantha "Problem from Hell" Power, who wrote the -- well, a -- book on the lack accountability for war crimes. What does she think of the statement? The U.S. Government welcomes President Rajapaksa's announcement of his intention to establish a Commission on Lessons Learned and Reconciliation to examine key aspects of the recently ended conflict in Sri Lanka and his acknowledgment in doing so that accountability for serious violations of international humanitarian law is a crucial pillar of national reconciliation and the rule of law. Experience in other countries has shown that commissions of inquiry can play a valuable role in advancing accountability when they are appropriately constituted and enjoy broad public support. Particularly important in this regard, broad experience has shown that to be effective in advancing accountability and reconciliation, commission members should be and be perceived as independent, impartial and competent; their mandate should enable them fully to investigate serious allegations of violations and to make public recommendations; commission members and potential witnesses must enjoy adequate and effective protection; the commission must receive adequate resources to carry out its mandate; and the Government should undertake to give serious consideration to its recommendations. We hope the commission will also reflect the desires and requests of the citizens of Sri Lanka, who were the primary victims of the conflict. Being responsive to their needs will be an important measure of the commission's success. In light of these general principles, we would welcome the Sri Lankan Government's commitment to give the Commission on Lessons Learned and Reconciliation a mandate to probe violations of international standards during the final stages of the conflict and to identify those responsible and, we would expect, to make appropriate public recommendations based on its findings.